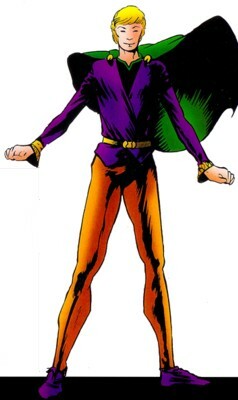 Powers/Abilities: He possessed vast magical abilities, but although he was very talented he couldn't control his powers too well. He used his abilities to hide behind a charade, project different mystic bolts (Bolts of Bedevilment, Flames of the Faltine and Wrath of the Chill Ikthalon) and shield himself against mystic attacks. (Marvel Fanfare I#6/2 (fb) - BTS) - For ten years Ian learned the mystic arts, intending to challenge the Sorcerer Supreme. (Marvel Fanfare I#6/2) - Ian went to the Sanctum Sanctorum and rang the bell. Wong opened the door and Dr. Strange told him to let Ian in because he had been waiting for the boy and knew why he was here. Surprised that Dr. Strange knew so much, Ian ended his charade of normalcy and showed his true colors as a sorcerer. Ian challenged Dr. Strange to a mystic combat and Dr. Strange accepted the challenge. Dr. Strange led Ian to a door and told him that they would fight inside that chamber. Dr. Strange vanished when Ian blinked, and the boy entered the chamber after him. He was surprised by the strange area he entered, but he attacked nonetheless without further delay. Dr. Strange fought off his attack and tried to blow away Ian with the Winds of Watoomb, but Ian was able to restore his body. He assaulted Dr. Strange again and seemingly killed him with the Flames of the Faltine. Ian declared himself the new Sorcerer Supreme and was shocked when he realized that he killed Dr. Strange. 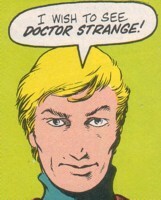 Strange's body dissolved and seconds later an arrogant sorcerer appeared and attacked him to become the new Sorcerer Supreme. Ian defeated and seemingly killed him too. Ian thought that the killing was a curse of the Sorcerer Supreme, but he didn't get much time to think about it as the sorceress Elata appeared and Ian defeated and seemingly killed her as well. Suddenly dozens of doors opened and as many sorcerers challenged Ian to a mystic combat. Ian wanted it to end and his screams were heard by Dr. Strange. Suddenly Ian was back in the Sanctum Sanctorum and Dr. Strange was behind him. Dr. Strange told Ian that he was talented, but that he still had to learn how he could use his magic without killing. Ian agreed and wanted to know if these fights really happened. Dr. Strange calmed him by telling him that Ian had killed nobody, but he didn't tell him if the fights were real or not. Dr. Strange restored Ian's charade and Ian left the Sanctum Sanctorum. He saw two boys playing cowboys and smiled when one boy realized that it wasn't fun to be the best all the time when his friend ran away. (Marvel Tarot#1 (fb) - BTS) - At an unrevealed moment in time Topaz saved the life of sorcerer Ian McNee. McNee thought he wanted to die but was eventually stopped as Topaz told McNee to "shut the hell up". McNee laughed so hard that he knew he wasn't ready to let go and let Topaz heal him. (Mystic Arcana: Magik#1 (fb) - BTS) - Ian opened the Cornerstore on Creation magic and curio shop in Brooklyn, New York, employing a Mr. White. (Civil War: Battle Damage Report) - Tony Stark listed McNee's status as undetermined. (Mystic Arcana: Magik#1) - Dreaming of drowning in a mystic sea, Ian's spirit was apparently trapped within the Serpent's Sea (the realm of Set) by Chthon. Posing as Oshtur, Chthon appeared to Ian and offered to save him in exchange for restoring the ancient Egyptian mystic Heka-Nut to save the mystic realms. After Ian vowed to do so, swearing by the thrice conjured crossroads, "Oshtur" instructed him to use the First Tarot to find the "Four Aces," to gather the Cornerstones of Creation, starting with the Ace of Swords. Ian then awoke suddenly found it to be 6pm, dusk, and he told his employee Mr. White about his new quest. (Mystic Arcana: Sister Grimm#1/3) - As the gathering of the Cornerstones of Creation was necessary to restore the fabric of magic (damaged in the War of the Seven Spheres), the real Oshtur aided Ian in his quest. (Marvel Tarot#1) - Ian McNee used the First Tarot to explore the nature of magic in the universe, learning many secrets about many beings, places, etc. before embarking on his quest for the Cornerstones of Creation. 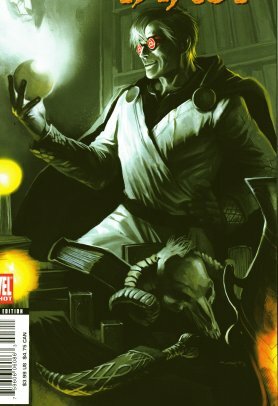 (Mystic Arcana: Magik#1/3) - Traveling aboard a train bound for the Theban Necropolis, Ian encountered and recognized the mystic significance of Ammut, guardian of the Throne of Bone and the Halls of Ma'at (an aspect of Oshtur). Ammut transported Ian to the Halls of Ma'at on the psychic plane where they discussed his quest. In order to test Ian's worth, Ammut challenged him. Ian mistook the challenge for mystic combat and used power from Valtorr's Vial to futilely assault Ammut, who consumed the mystic attack and then revealed that the real challenge to be a riddle; if Ian succeeded, he would be given the Sword of Bone, but if he failed, Ammut would consume his mind. After some struggle, Ian solved Ammut's riddle and was given the Sword of Bone, the Cornerstone of Oshtur, symbolizing the ancient element air. Returning to the train, Ian hears Ammut telling him he must next seek out the Ebon Rose from its holder, Morgan Le Fay. (Mystic Arcana: Black Knight#1) - Ian found the portal to Avalon and made his way towards Morgan's castle, of which Morgan was notified by her agent, Tapestry. Morgan evaluated Ian, noting that he had an edge, a dark outline, however white his interior might be. (Mystic Arcana: Black Knight#1/3) - Morgan sent enchanted trees to attack Ian, though he fought them off by summoning the Claw and Bane of Damballah, and the Seraphim's shield. She then summoned Ian to her chambers through Tapestry. As he requested a boon from her (the Ebon Rose, the Cornerstones associated with Gaea), Morgan tried to look him in the eyes. Knowing this would make him her slave, he refused to look, but he spoke the words "My Lady Le Fay." Morgan recognized that he was using magic to influence her, and he admitted that he was making his voice mimic Merlin's to play on their past love. Seeing similarities in his devious ways to those of Merlin's and recalling her past affection for Merlin, Morgan sent Ian to the blackened forest where he would find the Rose. In the silent forest, Ian located the Rose and gave thanks to Gaea and Morgan for their aid. Watching from a distance, Morgan stated that if they met again, she would tell Ian of the dark man. She further noted that she could not protect him from Set as he sought the Serpent Crown in his quest to assemble the Cornerstones of Creation. (Mystic Arcana: Scarlet Witch#1 (fb)) - Morgan gave Ian a kiss and a warning: she enchanted a stone petal from the Ebon Rose and told him to swallow it, noting that the petal would allow him to speak with Gaea's children, both flora and fauna, giving him a measure of control over them. She told him that the next two Cornerstones he sought were much more dangerous, as he would seek them from Gaea's dangerous and powerful brothers, the Serpent (Set) and the Wolf (Chthon). (Mystic Arcana: Scarlet Witch#1) - Ian recorded his quest's progress in his journal. (Mystic Arcana: Scarlet Witch#1/3) - Via the Winds of Watoomb, Ian traveled to the ocean's floor, encountered Llyra and Nagala as the latter created a new Serpent Crown, and he used the Rose petal's magic to learn the two women's origins. Llyra ensnared Ian with her now monstrous tail and began crushing him, but he played upon Llyra and Nagala's rivalry, tricking them into fighting jealously. Ian took the Crown and escaped. (Mystic Arcana: Sister Grimm#1) - Ian asked the First Tarot for aid in his quest, and the advice he received -- from Magik (Illyana Rasputin) via the Justice card, Morgan Le Fay via the Empress card, and Nagala via the Emperor card-- led him to question the quest's true nature. Magik questioned the time of arrival of "Oshtur, the Bright Lady of the Dawn"; Morgan questioned whether he had accepted the quest with a pure heart or whether he had been coerced; and Nagala noted that Lord Set had not cast Ian into the Serpent's Sea, so who else had the power to do such a thing. Ashake remained trapped in the present, and Oshtur appeared before them both back on Earth, telling them that the assemblage of the Cornerstones has helped repair the structure of magic. There was more work to be done, though it could wait for another day. Comments: Created by Roger Stern & Charles Vess. It's not seen in the pictures above, but Ian had green eyes (apparently he could magically alter their appearance). Except for Elata all sorcerers challenging Ian stayed unnamed. Were the fights and the participants except Ian real or not? Only Dr. Strange knows! Ian McNee has an entry in Mystic Arcana: The Book of Marvel Magic and he is currently pretty busy in Mystic Arcana. The Cornerstones of Creation have a small entry in Mystic Arcana: The Book of Marvel Magic. Further, the Mystic Arcana series re-defined the Cornerstones as the Darkhold (powered by Chthon), Ebon Rose (powered by Gaea), Serpent Crown (powered by Set), and Sword of Bone (powered by Oshtur). I'm not 100% certain how that story fits in in with the Hyborian era story, so I'm leaving this entry as is for now.